The Governor of Lagos State, Akinwunmi Ambode, on Sunday said his only opponent for the All Progressives Congress’ governorship ticket, Babajide Sanwo-Olu, was not credible. Sanwo-Olu currently has the backing of the powerful Mandate Movement on the Lagos APC and that of the National Leader of the party, Asiwaju Bola Tinubu. The governor who lashed out for the first time since his rift with Tinubu, his godfather, became public knowledge, added that the other aspirant (referring to Sanwo-Olu) was not fit and proper to occupy the seat he wanted for a second term. Ambode, who spoke during a world press conference at the Lagos House, Ikeja, alleged that Sanwo-Olu was once arrested for allegedly spending fake dollars in the US, adding that he was once a patient at the Gbagada General Hospital, where he had gone for rehabilitation. He said, “The aspirant that has been put up to contest against us is not a fit and proper person to take this job. “This particular aspirant is somebody that has been arrested for spending fake dollars in a nightclub in America, and was detained for months. “It is also known that he doesn’t have the competence to do what he is being propelled to do. This is somebody that has gone for rehabilitation before. The records are there at the Gbagada General Hospital. The governor urged the National Working Committee of the party to ensure that the governorship primary scheduled for Monday (today) was free, fair and credible. Ambode said since the party had agreed to adopt direct primaries, it behooves on it to follow due process to ensure that every aspirant got a fair chance to contest for the ticket in a credible democratic process. “We believe that it is in the greater interest of the party to allow reason to prevail and allow every contestant to come out and show their strength. I believe strongly that it is in the interest of the country that our party should activate as much as possible all the democratic values that our party has always been known for and that is what I stand for,” he added. The governor said he was concerned that with less than 24 hours to the primaries, membership cards had yet to be distributed, while even as an aspirant, he had yet to be given guidelines for the election. He added that it would be injustice to deny newly registered members of the party the opportunity to exercise their franchise. “I believe that the preparations are still ongoing, but there are some few things that we still need to iron out and I believe that the chairman of our great party, Comrade Adams Oshiomhole, will be able to correct some of these things that we have noticed. “We are committed progressives; we are committed to the outcome of the primaries, but what we will not accept is the disenfranchisement of millions of people that we have been able to bring into the APC fold just by our performance. What we heard is that there is a register that is being brought into the state which has only those who have registered since 2014. What about all the millions of members of APC that we have gotten in from 2015 till date? “I take my own membership slip anywhere I go and now they say it is only the membership slip that I have; I don’t have a membership card and so the question is; are they saying that I as a governor will not be entitled to vote tomorrow (Monday)? So, the national headquarters and the electoral committee need to make immediate adjustment to this. “All the people that have registered as members of APC should be entitled to vote in the direct primaries; that is how we entrench the democratic values that we are all preaching. So, if someone like me can be disenfranchised because I don’t have a card, what happens to ordinary members of APC? We believe strongly that this can be corrected by allowing everybody to come out and exercise their civic duty and civic right to choose who will represent them as the gubernatorial candidate for APC. So, I plead with the NWC, I plead with our party chairman and even all the people that are interested in this whole process that we should do the right thing; we should make the process credible and I believe with God on our side, we would come out triumphant,” Ambode said. The governor said he was confident that his administration had set the pace since inception and any course to alter the process could have dire consequences on the party’s chances in the 2019 general elections. The governor stated that he remained the best man for the job, noting that his challenger, Sanwo-Olu, did not possess the requisite experience and psychological know how to govern the state. “Party leaders and even party members have been misled to understand that this (Sanwo-Olu) is a better candidate than me. I have done everything in the last three and half years to serve the people selflessly and to serve the poor and that is why you see that most of the projects you have seen is to alleviate the sufferings of the poor and the only way out for us is to continue to do that in the next four years. “We plead with all our leaders. They should have a rethink; this is not about me, but about the greater opportunities that APC stands to better the progress of Lagos and Nigeria,” he said. Ambode also expressed concern on the heated political situation in the state, saying the government would not fold its arms and watch political thugs disrupt the peace in the state. He explained that security reports available to the government indicated that there was an ongoing recruitment and arming of political thugs to disrupt the peace in the state in the guise of holding primary elections. “It has become imperative to put every stakeholder on notice, especially the Federal Government and security agencies, to take more than a passing interest in the development in this state. “The state government will do all within its powers in collaboration with relevant security agencies to protect our citizens and insulate them from any condition that may breed insecurity or the breakdown of law,” the governor said. But Sanwo-Olu refused to reply to the allegations made against him by Ambode. Sanwo-Olu declined to speak on Sunday when the Majority Leader of the House of Representatives, Femi Gbajabiamilia, and other lawmakers from the state in the lower chamber visited his Ikoyi residence to endorse him. On the allegations levelled against him by Ambode, Sanwo-Olu said he would rather play high as “others” had decided to play low. Speaking on behalf of the lawmakers, Gbajabiamila urged party members to vote for Sanwo-Olu during governorship primary, adding that the federal lawmakers from the state had endorsed him. He also urged party members to remain united no matter the outcome of the exercise. Gbajabiamila said, “This is the last political structure that is lending support to Sanwo-Olu. We needed to take our time, look at issues dispassionately and deliberate extensively. We had endorsed the governor before. He has done well in infrastructure development. But politics is dynamic. We have sat down (to think). Governance is not just about infrastructural development. “The GAC had spoken. I was at the meeting. There was no dissenting voice in GAC. Sanwo-Olu is a man of rich pedigree; he has intimidating credentials. He has a lot of experience. We are going to support him at the primary tomorrow (today). The lawmakers at the event included a former Head of Service, Yakubu Balogun, a former Commissioner for Local Government and Chieftaincy Affairs, Rotimi Agunsoye, Bisi Ayinla Yusuf, Jide Jimoh, Jide Benson, James Faleke, Taofeek Adaranijo, Ayodeji Joseph, Setonji Bamgbose, and Wole Diya. Meanwhile, Tinubu on Sunday formally endorsed Sanwo-Olu. According to him, the master plan or blueprint put in place for the development of the state, which he and his immediate successor, Babatunde Fashola, implemented, had been departed from. Tinubu said this in a statement he personally signed on Sunday. He said his experience showed that when the state government remained true to that blueprint designed about 20 years ago, positive things happened. “During my tenure and Governor Fashola’s, Lagos State recorded improvements in all aspects of our collective existence, from public health to public sanitation, from free education to social services, from administration of justice to the cleaning of storm and sewage drains. “Businesses, large and small, invested and hired millions of workers and thrived. “I make no pretence that the master plan is perfect. It can always be fine-tuned. However, whenever a government departed from this plan without compelling reason, the state and its people have borne the painful consequence of the improper departure. “To ignore this blueprint for progress in order to replace it with ad-hoc schemes of materially inferior quality contravenes the spirit of progressive governance and of our party. Such narrowness of perspectives does not bring us closer to our appointed destination; it takes us farther from that destination,” Tinubu said. 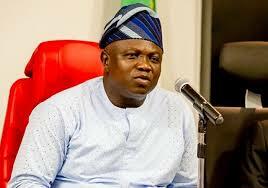 Also, councillors in all the 57 councils of the state on Sunday said the report that they shunned an invitation extended to them by Ambode was not true, saying it was a fabrication. Addressing a press conference at the headquarters of Ambode Mandate Support Group (AMSG) in Ikeja, the councillors, who had earlier endorsed the second term bid of the governor, added that the report was unfortunate. The Director General of AMSG, Hakeem Sulaimon, commended the councillors, saying they have done what party leaders failed to do. The Peoples Democratic Party on Sunday said it reviewed the world press conference held by Ambode and surmised that the governor validated its position that the APC allegedly consisted of those it described as fraudsters and election riggers. He added, “That is why the APC will have no scruples to project persons of questionable character and those with allegations of corruption hanging on the necks as their National Chairman and governorship aspirants.